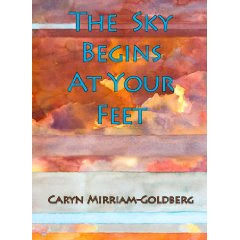 I am happy to have Caryn Mirriam-Goldberg, author of the memoir The Sky Begins At Your Feet, visiting with us today. I really enjoyed her book and am so glad she found the time to do an interview with me. You can read more about Caryn on her website, as well as her blog. Nessa: I found your memoir The Sky Begins At Your Feet to be a deeply moving book. At times I was near tears, others almost giggling. What made you decide to write about your battle with breast cancer? CMG: I find that I write about whatever I'm going through, and I particularly started this book as a way to move through chemo without losing my mind, or at least, documenting the loss of the my mind. I would write after each chemo infusion, then hand my oncologist the pages, which detailed my dreams, physical reactions, thoughts, family happenings, etc. To his credit, and with my permission, he made these pages part of my medical record, which helped me enormously: it made me feel seen as a whole person and not as a diagnosis. Then I kept writing, and things entered into the story -- such as my father's diagnosis of pancreatic cancer, the incredible community I found myself in, and many moments of wonder -- that took the story directions I never expected. Nessa: What did you learn about yourself as you wrote your memoir? CMG: I learned how much writing can help me, and others too, to reinhabit our own bodies. By writing about my struggle through cancer, and my struggle to give up judging my imperfect body and learning to love being in a body that could heal and strengthen itself after so much challenge, I found I could start to treat myself with much greater respect. I also learned more about the sacredness of community, and how much calling the circle around us whenever we face difficulty, is a gift for us and for others in the circle. It shows us more about why we're alive. Nessa: I know you write poetry, as well as nonfiction. Do you prefer one over the other? CMG: I also write fiction and in other genres, and while poetry is my oldest love, I love all kinds of writing. Generally, I turn on the faucet and see what comes out: poetry, non-fiction, fiction, etc. I did find that many decades as a poet helped me enormously in writing a memoir: it gave me an easy way to spot important images and riveting rhythms and helped unfold the story. Nessa: What made you start writing? CMG: I began writing at age 14, right in the middle of my parents' divorce. Before then, I drew all the time, but suddenly, I needed words, and so started with poetry. My poetry tended to be about depression and fear for many years, along with trees and sky (which I still write plenty about), but writing became my main form of prayer and therapy over time. Nessa: I understand that you are the Poet Laureate of Kansas. Can you tell us more about that? CMG: It's a wonderful and humbling honor. Basically, this is a public office, and as a public poetic official, I get to travel around Kansas and lead writing workshops, give readings, do a radio show on writing from your life, and talk with many groups and individuals. My main project is helping communities start their own writing circles, and to help as much as I can with showing people how reading and writing literature can greatly enhance our lives and infuse our communities with greater meaning. Nessa: What projects are you currently working on? CMG: I'm currently writing a non-fiction book about the stories and friendship of a Holocaust survivor and Polish resistance fighter who met in Lawrence, Kansas and became best friends. It's a story that's taken me deeply into research on Poland, the Holocaust and World War II, and also how people live with seemingly un-healable wounds. I'm also working on a novel about Miriam -- from the bible, Moses' sister -- set in contemporary America where she wanders this country for 40 years, looking for home. And I'm always writing poetry, and with singer Kelley Hunt, songs. Caryn Mirriam-Goldberg received her doctorate from the University of Kansas and was recently appointed the Poet Laureate of Kansas. The author of four poetry collections she is certified in poetry therapy and has led workshops for many groups, including people living with physical and mental illness. In 2000, Caryn founded the Master’s level program in Transformative Language Arts, that focuses on the effect of written and verbal language on the community, at Goddard College where she teaches. Her writer’s guide Write Where You Are is unique in that it is directed to teenage writers. Caryn co-founded Brave Voices with singer/songwriter Kelley Hunt to provide singing and writing workshops. Song written by Caryn have been performed by the Kelley Hunt band both in the United States and Europe. Caryn’s musical talents also include playing the cello. add this to the other basket auction? Do you think you turned to writing during a difficult time because you are a writer or if you think other people, normally not writers, also turned toward writing during their illness? Maybe because we all feel a need to leave a record of our life?